The term Ethnobotany consists of the two words “ethno” and “botany”. The word “ethno” is attributed to people, culture, aesthetic, language, knowledge, and practice. Botany describes the study of plants. The combination of these words, the scientific discipline Ethnobotany, investigates the relationships between humans and plants. Since the beginning of humananity, the human-beings depended on botanical knowledge for surviving [Flagler1994, page 4]. Ethnobotany documents and characterizes this gathered knowledge of plants in various cultures. The research fields include documentations about food, medicine, construction, textiles, rituals, art and others. The comprehensive scope of research topics assigns Ethnobotany to a classical multi-disciplinary study. The interdisciplinary team of scientists must have knowledge in botany for identification of plant species, anthropologic knowledge for describing the cultural scope, and a linguistic training for transferring the local terms to the scientific community. The field of Ethnobotany is far too complex for describing and outlining all its relations in this thesis. Rituals with plants as well as the discipline Floriography (The language of flowers) depend strongly on local and cultural origins. To focus only on one cultural and local origin would limit the exploration of Human Plant Interfaces too much. Therefore, the thesis deals with Ethnobotany topics related to art and human well-being in general. Fortunately, Asano-Miyake (2002) provides in his concept “Healing Landscapes” an appropriate scope for describing these relevant relations in context of Human Plant Interfaces [Shoemaker2002, pp. 55-59]. 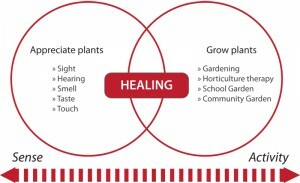 His model involves the positive effects of plants in human perception and the positive impacts for humans through direct interaction with plants. In addition this chapter reasons why plants are a useful tool for interface design and how contemporary artists and designers use plants in their artistic works. After all, plants provide a more comfortable life for the human being. This includes the plant’s production of construction materials and the possibilities of using plants for medical treatments [Flagler1994, page 19]. Not to mention the invention and developments in agriculture, which established an increasing independent human lifestyle compared to the ancient natural ecosystem. The result of this adaption is observable in a still growing movement of industrializing and urbanization. Unfortunately these developments cause a disconnection to our conscious of nature. One side effect is the negative impact on the human mental health. Acceleration and more complex life circumstances emphasize the perception of stress and unbalance. Especially, the hectic lifestyle in cities and the ambient communication technology stimulate our out-dated physiological fight/flight reaction system, which results in maladaptive human behaviour [Shoemaker2002, page 138]. Plant based environments can break through this process and provide a more relaxed and decelerated environment. Landscape architects are already aware of this problem for several hundred years. Their answer for this problem is to create parks in urban and natural oriented environments [Flagler1994, page 6]. How a human experiences the visual appearance of plant depends on various factors. The cultural background [Shoemaker2002, page 258] and even the childhood [Shoemaker2002, page 277] are one of these factors. Some contemporary artists are driven by the forces of reunion the nature with our current urban-based lifestyle. Furthermore, they explore various artistic and scientific approaches to establish a more human friendly environment through plants [Bartel2001, page 181] [KastnerWallis2010, page 15]. 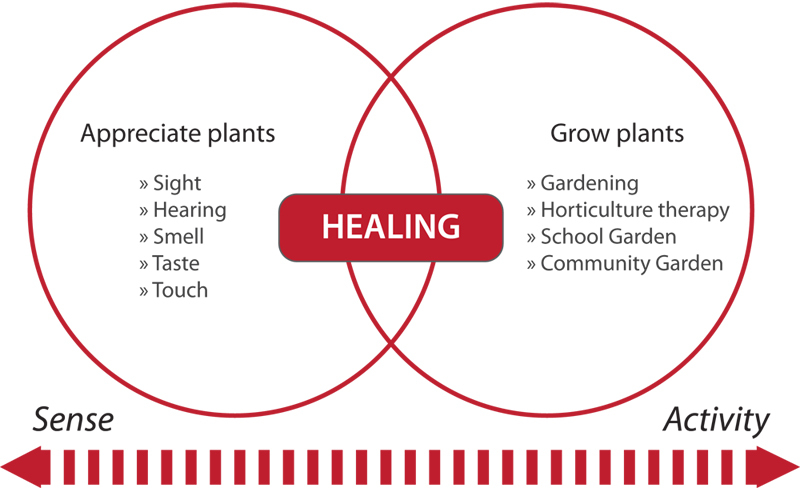 These approaches range from a passive sensual perception to direct interaction with an environment as it was already described above in the Miyake’s model of a “Healing Landscape”. The following exploration of plant based artworks suggests solutions how to involve plants in our daily environment. Beyond that, the overview provides a base for the research results in chapter 3 about visualizing data with plants and social designs with the support of plants. Artists work with plants for demonstrating the relationships between human, art, nature and environment. They reveal interactions and processes of these connections, which mostly correlate with the topics space, time, ecology, life and death [Bartel2001, pages 72, 74, 86, 179]. Furthermore, some of their artworks present the dynamic characteristic of plant-based material and the singularity that nature is able to produce [Bartel2001, p. 76]. Additionally, the plant-based material is very eco-friendly and can be easily integrated in its natural environment. From the end of the sixties until today, artists investigate the possibilities that plants provide for their artistic expressions. The visual appearance of the contemporary plant based artworks ranges from two dimensional representations to sculptures and installations. The artworks “Großes Rasenstück”(1979), “zonder titel” (1980), “Wiese“(1986), “Das Verschlossene Paradies”(1989) by Herman de Vries demonstrate how the artistic expression can differ in size and shape [Bartel2001, pages 73-77]. Landscape painting was in the past and still is a very common visualization technique for an artificial representation of nature. Instead of using paint for visualization, artists explore plants as materials [Bartel2001, pp. 92] for their painting like a canvas. In 1979, Herman de Vries used plants for exposing the interactions between randomness or order visually. His artwork “Großes Rasenstück” (1979) is a great example how organic material can be utilized for a plant display [Bartel2001, page 73]. In contrast to grass, the leaf is also a very basic piece of our natural ecosystem. Plenty of them exist in different shapes and materials. Lorenzo Manuel Durán is a master of using them in a stencil oriented approach. He creates amazing pictures inside the shape of a leaf. Furthermore, Anna Garforth uses leaves for mid-sized Typography installations, like “Rethink” (2010) [KlEhBo2011, page 211]. Leaves are a flexible, regrowing and ever-present resource. Anna Garforth shifted her approach of working with leaves to moss, which is exhibited in her artworks “Grow” (2013) and “Big Bang” (2013). Moss is a very practical material, which is able to live on walls, in shady locations and easy to shape. The Design Studio Mosstika proves that moss installations fit perfectly in urban environments. Besides of moss, the vertical garden approach is used more frequently by architects nowadays. They create green walls for a more nature-oriented experience of buildings (see figure 8 on page 30). Besides they utilize the cooling effect of the plants to decrease the building’s temperature and thereby to reduce the energy consumption of a building. Additionally, this has a positive impact on the environment. Engineers, designers, and the DIY community have already discovered the vertical garden for their own applications. Aside from these small to mid-size to huge 2D surface approaches, artists and designers investigate sculpture and technical construction with plants as well. Especially the given spatial and environmental conditions have great influences and challenges for their artistic activities. Additionally, artists like Hans Haacke and Sjoerd Buismann were fascinated by the dynamic characteristic of plant growth [Barthel2001, page 86]. Their “Wachstumsskulpturen” make use of directed growth through a construction of light. The goal of this approach is to create certain shapes and deformation of a plant. For instance, the artwork “Gerichtetes Wachstum” (1972) by Hans Haacke [Nemitz2000, page 62], “Willow Project 1” (1971/1972) and “Wilgenconen” (1980-1990) by Sjoerd Buisman [Bartel2001, pages 88-92] are great examples for natural structured directed growth. In contrast to the constructional approach, the plant abilities of phototropism (light) and geotropism (gravitation) are utilized in the artworks “Phototropisch Groeiobject” (1969) by Sjoerd Buismann [Bartel2001, page 87] and “Grass Grows” (1969) by Hans Haacke [Nemitz2000, page 63]. Nowadays, the artist Azuma Makoto is well known for his plant sculptures. One of his masterpieces “Collapsible leaves” (2013) is a great example of plant-based sculptures in the domain of interior design. In relation to environmental design, the Montreal Mosaiculture Exhibition from 2000 to 2013 presents an extraordinary collection of mid-size to huge plant sculptures. In association with installations and narratives, plant displays are also an encouraging approach. A plant display combines a collection of plants in a specific arrangement. It is similar to the Japanese tradition Ikebana, which involves the narrative aspects of plant arrangement. Herman de Vries’s artworks “zonder titel” (1980) and “Das Verschlossene Paradies” (1989) are good examples in this realm [Bartel2001, pages 74-77]. The plant species and its visual appearance (size, colour, etc.) are part of his artistic approach. Moreover, plants are used for creating fictional subspaces, like Banksy did in New York in 2013. In the following we call this kind of subspaces inside a natural, urban, or interior environment: Plant installations. Plant installations are usually bigger than sculptures and they bridge the gap between Gardening Designs (for instance “Garten”, 1996/97, by Peter Fischli and David Weiss) [Nemitz2000, pages 51-53] and Land Art as well as landscape architecture. Plant installations can exist in a gallery context or in the open air. In contrast to this, Land Art exists only in the open air and holds a very strong relationship to its environment. The interactions between humans and their land are very complex. The rapid integration of technology in our life caused an increasing encapsulation from nature. Land Art artists are driven by the inner motivation of enhancing the lost ecological consciousness [KastnerWallis2010, page 15 - 17]. Land art has its origins from minimalism and conceptualism movements. Their manifestation is encompassed to earth, ecology and environment. In this context Land Art holds artistic approaches of sculpturing and performance based art [KastnerWallis2010, page 12]. The physical size of the artworks ranges from mid-size to very large installations. For instance, the artwork “7,000 oaks” (since 1982) by Joseph Beuys is installed through the entire city Kassel in Germany and is also connected to performance art [Nemitz2000, page 30 - 31]. The action of planting a tree requires the power of several people. They have to help each other and they have to deal with the environment for performing a successful tree planting. Those emerging interactions between the involved parties can be associated to Joseph Beuys’s idea of a social sculpture. The artpiece “Trümmerflora” (1988) by Harrison had its place on an abandoned area in Berlin. Harrison’s artwork demonstrated exemplary how these artists integrated time and natural forces to their projects[Kastner2012, page 64]. Land Art artist Nils-Udo is another extraordinary artist, who involves these forces to his artworks (e.g. “The Nest”, 1978 & “Tree Roots”, 1995 & “Summer in the Park”, 1999) [Rueth2013]. His pieces are very often located in a forest or other natural oriented environments (e.g. parks). Nils-Udos artworks are characterized by the usage of environmental available resources for creating his sculptures and installations. The common phenomena of crop circles make also a heavy use of environmental resources. In that relation, the artwork “Cancelled Crop” (1969) by Dennis Oppenheim is a good example [Bartel2001, S. 45]. The artistic practices of Land Art suggest us solutions, how art and design objects are harmonically integrated into a natural environment. Beyond the visual approaches, Land Art is also strongly related to social and cultural scopes. Especially, the first generation of Land Art artists intended social activations of spatial conditions [KastnerWallis2010, page 28]. For instance, the British collective PLATFORM works closely together with local communities. They help the people to restore their harmed environments. For avoiding a repetitive destruction by humans, the PLATFORM collective educates people about nature through their environmental interventions. Additional topics of their teaching are the usage of alternative energy production, waste management and information distribution about a sustainable life. In almost the same manner Joseph Beuys’s Land Art project “7,000 oaks” yielded on distributing his idea of a green ecological society [KastnerWallis2010, page 35]. In summary, the mentioned art methods hold narrative and aesthetic aspects. They present a visual design vocabulary and develop a comprehensive knowledge about craftsmanship with plants. In addition, the artworks present approaches how artworks and natural artefacts can be harmonically integrated in our daily life and environments. Moreover, this thesis describes how projects like PLATFORM benefits from current communication technology. Chapter 3 will introduce methods about integrating electronic and digital technology in natural based artworks. [Bartel2001] Bartelsheim, Sabine (2001). Pflanzenkunstwerke: Lebende Pflanzen in der Kunst des 20. Jahrhunderts. Schreiber, 2001. [Kastner2012] Kastner, Jeffrey (2012). Nature - Documents of Contemporary Art. MIT Press, 2012. In relation to plant sculptures the horticultural practice Topiary looks very interesting and helpful for learning the craftsmanship of shaping a plant. Beyond the craftmanship, Moodý Photography documents in his Facebook post very nice how Street Art (graffiti) can be combined with plants for creating a new visual experience (another nice blog post). [AiBrBa2012] Aiello, Amy Bryant; Bryant, Kate; Baldwin, Kate (2012). Wunderwelten im Glas: 50 kleine, feine Pflanzenarrangements. Bassermann Inspiration, 2012. [Palmer2014] Palmer, Isabelle; Franz, Angelika (2014). Indoor-Gärtnern: Charmante Pflanzenarrangements und fantasievolle Miniaturgärten. Deutsche Verlags-Anstalt, 2014. Another tumblr blog “plants in contemporary art” collects and presents contemporary plant artworks in a nice photo slide view. It is a great resource of inspiration. Natasha Myers is the Associate Professor for the Department of Anthropology and Institute for Science & Technology Studies at the York University. In the domain of her Plant Studies she investigates the relationship between artists and plants on an Anthropologic approach. In my opinion this chapters lacks of of good references in green walls / vertical gardens. Therefore here some additionals books and links. [DuKin2008] Dunnett, Nigel; Kingsbury, Noel (2008). Planting Green Roofs and Living Walls. Timber Press; Rev Upd edition, 2008. [Uffelen2011] van Uffelen, Chris (2011). Facade Greenery. Braun Publish, Csi, 2008. [Edel2013] Edel (2013). Future green: Architektur und Design für eine bessere Zukunft. Phaidon Press, 2013. Another great land art project demonstrates the plants capability of cleaning soil from environmental damage. This project “The Iron Ring (2013) by Cecilia Jonsson is described in more detailed in an e-book and how the grass Imperata cylindrica is applied for the environment of the Río Tinto mines in Spain. Gavin Munro founded the company Full Grown, which produces furniture and design objects/scultpures with grown trees. They make use of the plant’s growing process and they shape the steams in their wished direction. The result is a Wachstumsskulptur with a design purpose. Imagine how it looks when people wear plants instead of clothes. The photo series Eyes As Big As Plates (2011-ongoing) by Karoline Hjorth and Riitta Ikonen captures this very nice. The artist collective Plants Out of Place dedicated their activities toward contemporary design, art with natural materials in relation to ecology. This is a very nice article about Women in the Land Art Movement around 1970. Especially, the artwork Garden Web (1977-78) by Audrey Hemenway is a good example for this women and nature movement. Soil is one of the important component for plants and ecology. Some artist dealt with the topic soil. For instance, the installation Out of Soil (2015) by Myriel Milicevic and Susanne Jaschko (prozessagenten) combines Soil and the princliples of Information Design to encourage the discussion about soil and food production. Shaping a tree or a plant to a house or a meeting place (e.g. Tanzlinde) is not really new. A tree as a meeting place in the centre of a village is still a common practice in Germany. Architects deal with this topic as called as Baubotanik in Germany. The craft technique is called “geleitete Bäume” and can be also found as “Stufenlinde“. Another living building for celebrating rituals is the “Weidendom” (i.e. in Schlepzig). Graefe, Rainer (2014). Bauten aus lebenden Bäumen – Geleitete Tanz- und Gerichtslinden. Geymüller Verlag für Architektur, 2014. Anothher approach of building something with living plants is the Urban Gardening method Fruit Walls from 1600! Another interesting term in that context is Hortitecture. It describes and explores the interesection of architecture and vegetation/horticulture. The technical University in Braunschweig (Germany) teaches and execute research studies. The Land Artist duo Wolfgang Buntrock and Frank Nordiek create and produce Land Art installations in Germany already for more than 20 years. They offer their experiences in workshop formats or as creators of nature sculptures in public (urban) spaces. In Japan they creat stunning giant pictures on rice fields, which is called rice paddy art. TetraPot (2016) by by Sheng-Hung Lee and Wan Kee Lee is a very interesting project for a sea-defence application with the help of mangrove trees. Taryn Simon uses floral arrangements to document international politics. In her artwork Paperwork and the Will of Capital (2015), she shows how systems of power work. Diana Scherer is experimenting with the roots of plants for generating patterns and structures. See her artworks Interwoven (2016) , Harvest (2015), and so on in this online article. Making music with plants less new but that Vegetable Orchester (1999-2003) from Austria is a pretty cool project. It shows how much playful interaction vegtables can offer for a creative process. Very interesting lecture about Botanic Architecture: The Lost Archive by Mark Primack, Architect Santa Cruz, California, at Vorholzer Forum, TUM Department of Architecture, Arcisstrasse 21, Munich on November, 13th of 2017. With an introduction to Baubotanik Research by Prof. Dr. Ferdinand Ludwig. Mark will speak about his vision of botanic architecture and the famous Tree Circus in Califonria which he rediscovered, documented and saved from being bulldozed in the 1970s. Xenius on Arte reported very nicely about co-design with plants in context of baubotanik. Furthermore, the architecture band cultural aspects of Tanzlinde was discussed and the green landscape architecture of Singapore.